Washington STEM is pleased to congratulate the Washington State STEM Education Foundation on ten years of providing leadership, support, and innovation for students seeking a high-quality STEM education in the Tri-Cities! Founding and supporting Delta High School, which has graduated over 400 students in the past eight years. 80% of these students have gone on to postsecondary education – two thirds of those students are pursuing STEM degrees! Supporting the development of a true STEM pathway for Tri-Cities students with four STEM elementary and one STEAM middle school. Designing STEM Like ME! – a program which recruits, trains and schedules STEM professionals to engage middle school students in hands-on learning activities to build a vision and spark a passion for STEM careers in students on the cusp of learning what career they might pursue. Launching and funding the STEM Like ME! grants for teachers program that has provided grants for 2,400 K-12 students to participate in STEM events and activities that include meeting a STEM professional engaging in career connected learning. 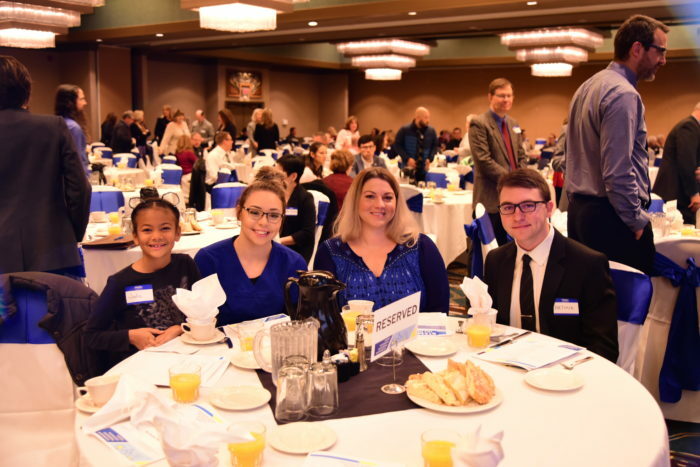 In November 2018, Washington STEM was pleased to attend a ten-year celebration of Washington State STEM Education Foundation’s accomplishments. Nearly 300 business, labor, community, and education leaders attended the Pasco celebration, including elected officials, company CEOs, students, and educators. A highlight of the event was a panel featuring four students in STEM education, including Arthur, completing a 4-year degree in engineering at WSU; Karley, seeking a technical degree in nuclear technology at Columbia Basin College; Kylie, training to become a dental assistant at Tri-Cities Skills Center; and Jada, an elementary school student exploring life on the moon through her after-school robotics class. Congratulations to the Washington State STEM Education Foundation and to the Mid-Columbia STEM Network for ten years of achievement in the Tri-Cities. Your efforts are a model for and inspiration to the rest of the state!